To make this baby bear cake, take a round 3 pound cake pan. 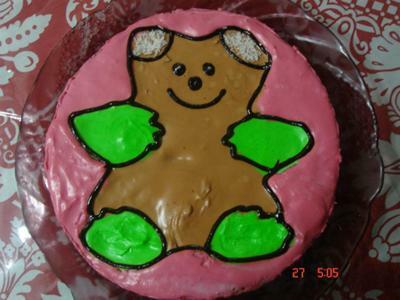 Bake a plain vanilla cake,then to make this baby bear cake you just need fresh double cream and 3 colours to make the body parts of the bear (pink,chocolate brown colour,and light green). Just mix the colours seperately in beaten fresh cream and then melt the chocolate in a double boiler and pour it in a piping bag. Make the outline of the bear with this melted chocolate. After making the outline, you can easily fill the coloured fresh cream in different parts of the bears body. Make the eyes with chocolate. Your cake is ready to serve.